The Half-Life and Portal universe features many brands and companies, both actual (marked with a Valve logo) and fictional; some were also cut from the final game. This article aims at listing them, whether they be food, press, ammunition or any other brands or companies. Two brands can be seen on beer bottles featured as an ammunition to the cut Brickbat in the Half-Life 2 leak. These include "Dis Bee Goot" and "PalfAl". "Dis Bee Goot" beer bottle. Seven actual fruit brands are featured in the Half-Life 2 leak. These include "Beau Geste", "Golden Pears", "Mariposa", "Mustang", "Snoboy", "Strength" and "Mornin Judge". The first one is a nod to 1939 film Beau Geste. "Mornin Judge", featured on a composite industrial building texture. "Mariposa" and "Beau Geste" on a wall in early City 17. Several copyrighted brands were used on soda vending machines and/or soda cans during Half-Life's development. These include "Coca-Cola", "Fruitopia", "Minute Maid", "Sprite", "Diet Coke", "Surge", and "Moxie". Sprite soda cans were still included in the final game as a gib model. The copyrighted brand "Pepsi" was used on a soda vending machine during Half-Life 2's development. A soda brand used during Half-Life 2's development. Black Mesa Coca-Cola beverage machine. Black Mesa Fruitopia beverage machine. Black Mesa Minute Maid beverage machine. Early Half-Life soda can textures. An actual brand of food for the beef, dairy, poultry and swine industry throughout the United States and Canada. Seen on the Terminal plaza in the Half-Life 2 E3 2002 trailer. Was replaced later in the game's development by the Cafe American sign. Appears on a junk newspaper model. The original Flare Gun features the Orion Safety Products name and logo. The original Flare Gun with the Orion logo. A gas brand to be featured on the gas station pump model, as found in the leak and retail Half-Life 2 files. The name is an anagram of the real-world gas brand name "Texaco". It was replaced with Terin in the retail game. The Cetaxo texture from the leak files applied to the retail model. Gas pump model preview from the retail game files. The brand of a cut sandblasting cabinet that was to appear in Kleiner's Lab. "Arbeit" is a German word for "Work". Arbeit Laboratories logo on a cardboard crate texture. An unknown brand cut from Half-Life 2: Episode Two. Russian words, with grammar errors, for "Cossack Transit". The texture's filename indicates that the original name for this company was "Cossack Transport". An actual wire ropes brand, cut from Half-Life 2. Texture for a wood spool. An unknown brand cut from Half-Life 2. Was originally the McNess sign. 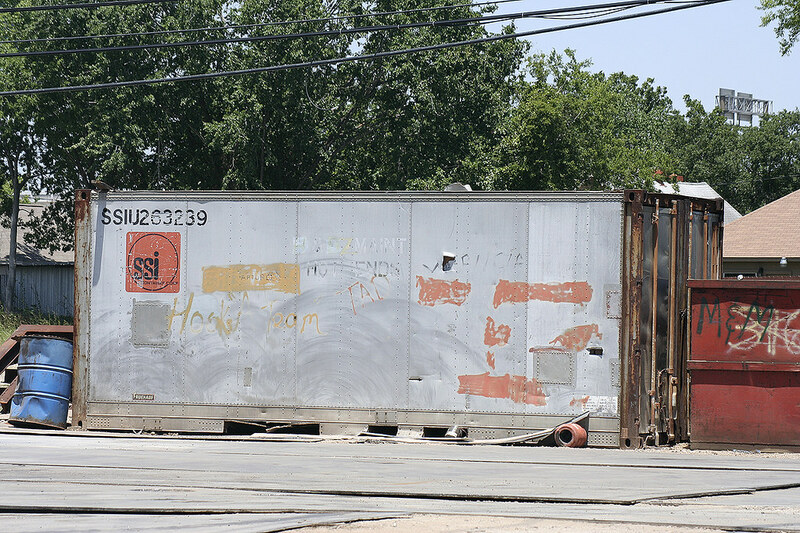 An actual brand CAI, short for Container Applications International, appeared on a world texture for a cargo container in the Half-Life 2 leak, and has been removed from the texture in the final game. CAI logo as seen on the texture. Its identification prefix "CAX" remained in the final version. The brand of a unknown machine that was to appear in Kleiner's Lab. An unknown brand cut from Half-Life 2. Appears in the Half-Life 2 leak as a name of the early Trainstation Plaza hotel, apparently a predecessor of "Terminal Hotel" in retail. Hotel Metropol is an actual name for a hotel in Moscow, Russia. Seen on the Terminal plaza in the Half-Life 2 E3 2002 trailer. Was replaced later in the game's development by the Teräs sign. An unknown brand cut from Half-Life 2: Episode Two. Russian word, with grammar errors, for "Corporation". The texture's filename indicates that this logo belonged to an iron ore corporation. An unknown brand cut from Half-Life 2. "Lumi" is a Finnish word for "Snow". An unknown brand cut from Half-Life 2. Finnish word for "Number 29". This brand is featured on the handle of the cut Ice Axe along with a stylized mountain logo, with the last two letters in "Supply" almost completely scratched off. The Ice Axe with Reeve Outdoor Supply on its handle. An unknown brand cut from Half-Life 2: Episode Two. Incorrect Russian translation, with grammar errors, of "Northern Logging". As indicated by the texture file, the latter was the brand's supposed original name. An unknown brand cut from Half-Life 2. Danish word for "Star". An unknown brand cut from Half-Life 2: Episode Two. Russian words, with grammar errors, for "Subarctic Cossack". Texture files indicate that the original name for this company was "Subarctic Transport". An unknown brand cut from Half-Life 2. Finnish word for "Steel". Was originally the J. Hauptman Mens' Sportswear sign. An unknown brand cut from Half-Life 2. Apparently based on an ad for the "Perle 28" - a Belgian beer once made by the Caulier brewery - found in Brussels, Belgium. An unknown brand cut from Half-Life 2: Episode Two. Russian words for "trans continental". The texture's filename indicates it belonging to a shipping company. ТРАНС КОНТИНЕНТАΛ logo, first variant. The brand of a cut drill press that was to appear in Kleiner's Lab. Two fast food brands can be seen in a cafeteria in the Black Mesa Research Facility. These include "Big Tony's Pizza" and "Tesla's Tacos". Unused pizza box model intended for use in Central Transit Hub. The pizza texture was originally broken. Half-Life and Half-Life for Dreamcast features several soda brands that can be seen on the cans given out by vending machines. These include "Captivation", a nod to Captivation Digital Laboratories", "Dante", "Glub", "Grape Ape", "Guthrie", a nod to John Guthrie, "Hai! ", and "Yuck". Soda cans in Half-Life for Dreamcast. Whenever a trash can is destroyed in Half-Life, soda cans bearing this actual brand's name have a chance of appearing. A chocolate brand. The meaning behind the term "Koso" is not known. There is a player configuration file called koso.cfg in the game files left by a developer that went by the alias "Diggem", most likely a model designer judging by its contents. There is an unused line again referring to "Koso" spoken by the scientists in Half-Life: Decay: "Do you know what the word Koso is referring to, exactly?" One of the snacks vending machines brands in Half-Life. Black Mesa "Carousel Snacks" snack machine. Appears on a cork board in Kleiner's Lab. The word "Times" seems to be omitted or cut off. Appears on a cork board in Kleiner's Lab. Appears in one of the newspaper clippings on a cork board in Eli's lab. The New York Times cover ("End Is Near"). A brown-haired Isaac Kleiner on the cover of Popular Scientist. A .357 Magnum cartridges brand. The text on the back of the box reads "I'm just a crazy or kill-your-schoolmates kind of guy! Why dontcha join me in a spree?" Pre-release .357 Magnum ammo box, displaying ".44 Magnum". Back of the ammo box. An engine manufacturer. The brand is featured on the Airboat's engine. The logo of Costco's private brand Kirkland Signature can be seen on the car battery model. An oil company. It is the former owner of Dock 137. Stylized as "Ωhms. power inc." A Power Combat Vest Charger brand. A gas brand featured on the gas station pumps found in the Petroleum Station in Half-Life 2 and near the White Forest Inn in Episode Two. Northern Petrol containers at Dock 137. Northern Petrol logo as seen on blue containers. Northern Petrol logo as seen on red containers. The brand of Keller's motorized wheelchair. It is an actual manufacturer and distributor of non-acute medical equipment, including wheelchairs. PAK logo on a truck wreck. PAK logo on a poster. The 1975 logo of NASA can be seen on the Black Mesa Rockets. An unknown brand of liquid. Likely a nod to Formula 409. In the bus ride map. The projector used for the "Dollar$ and Sense" slideshow in Portal is based on the model LC-XT1 by the Eiki company. Flavia logo on a white paint can. Appears on a fridge model. A brand of insect repellents. Its advertisement sign is written in Romanian. Russian word for "Shipping". This brand is featured on generic cargo containers in Half-Life 2: Episode Two, replacing the Northern Petrol logo previously featured on them in Half-Life 2 and Half-Life 2: Episode One. A fighting video game. Prax Wars is a nod to Prax War, an actual canceled game by developer Rebel Boat Rocker, on which Gearbox's Randy Pitchford worked. A Scientist and a security guard playing Prax Wars 2: Dante's Revenge. An actual cargo container brand, it is featured on two world textures for a cargo container. SSI Container Corp. was acquired by Itel Corporation in 1968. SSI Container Corp. logo and identification prefix on a container's side. Sunset Scavenger was garbage collection and recycling services company based in San Francisco, California; it is now known as Recology. Its name can be seen on a dumpster model. Bulgarian and Russian word for "Technics" and "Equipment". A household goods brand (?). Veiko International logo as it appears in the Half-Life 2 leak. On an early City 17 street. On a wall near an empty playground in City 17. On the Autogun building at Station 21. Featured on a washing machine model. A clock brand. It is a reference to Wright Bagwell, a former Valve employee. On a texture from the Half-Life 2 leak. On the Trainstation clock model in Half-Life 2. On the Trainstation floor clock model in Half-Life 2. Yomani logo on a display screen. Zaida logo in the Half-Life 2 leak. Zaida logo in Half-Life 2. A company in Half-Life 2: Survivor that developed the three drinks usable in battle mode: the Jump Drink, Power Drink and Mind Drink. The name is a reference to the game's developer: Taito Corporation. This page was last modified on 14 February 2019, at 23:48.